We are not looking for another set of rules for Napoleonic Wargaming, so, when asked by the author of these rules if we’d be prepared to do a play-test and review of them, we thought long and hard before agreeing. Cover of Et Sans Résultat. They are an attractive looking set of rules. Reviewing and play-testing several sets of rules has lead us to settle on our adaptation of Shako, which we somewhat quaintly refer to as Shako-ANF. This has freed us to focus on the games, tactics and enjoyment, rather than struggling with rules concepts. It was clear to us that Et Sans Résultat was not going to challenge this mantle. Being divisional/brigade scale, they are at a level of operation above where we like to wargame. As we have the ability to play a game out in a ‘leisurely’ manner, leaving it set up if necessary, we like to have more detail than such a set allows, e.g. basic unit formations, separate small arms fire and actual representation of skirmishers. All that said, we decided to give them a go! 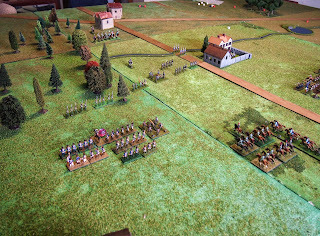 The reason was that a read of the rules suggested these were not yet another “new” set that is merely a tweak of existing ideas and mechanisms masquerading as something new, but rather a genuine attempt to contribute to the long list of rules for Napoleonic wargaming with a novel combination of scale and mechanics. It is apparent from the rules that the author, David Ensteness, has taken some of his inspiration from the better aspects of Empire, but has made a new, innovative set of rules that appeared to be eminently more playable. 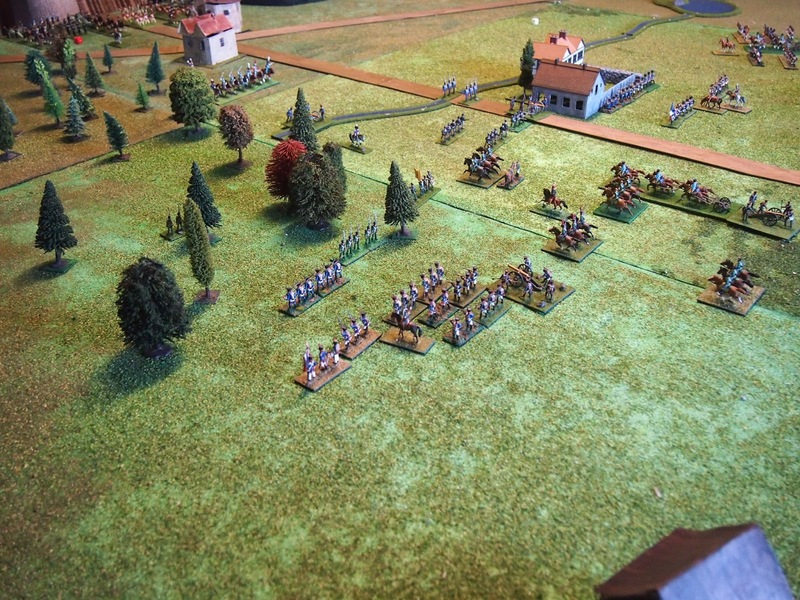 As we had it setup, and it seemed to suit, we decided to use Quatre Bras as our play-test of Et Sans Résultat. The difference in the density of figures on the table reinforced that these were never gonna be for us, whatever the outcome of the play-test. Please note: The default ground scale in Et Sans Résultat is 1” to 75 yards, or ~1 mm to 3 yards. We use a ground scale of 1 mm to 1–2 yards (adjusted according to the battle that we are trying to recreate). 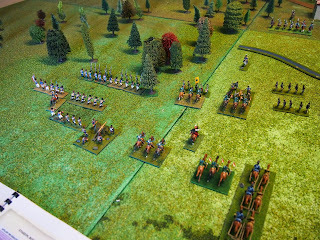 For our game of Quatre Bras we used 1 mm to 1.5 yards. We did not adjust our terrain for this game, so the figures in the photos are more sparsely distributed than they should be according to the rules. The rules are well laid out and easy to read. Sections are colour-coded and ‘call-outs’ dotted throughout explain the rationale behind key concepts. This apparent clarity, combined with some interesting looking mechanics suggested that, while we were not going to adopt them, it would be an interesting and enjoyable game. Unfortunately we were greatly disappointed. 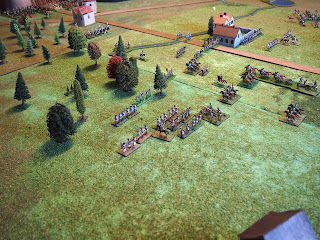 Prior to the game I expected that we’d play a couple of turns to give the rules a go and then work on our preparation for our Waterloo 200 game or, if we were enjoying it sufficiently, we’d play out the game in full. In the end we played two turns that were, frankly, hard work and had no time for Waterloo. “…designed to play out large battles and replicate particular facets of Napoleonic warfare… [showing] …the grand display of armies on large tables while focusing on the friction points of the Napoleonic Age: the timing of commitment and coordination of command. Players will act as senior commanders and direct the actions of large formations of troops”. We expected a fairly free-flowing game, while in no way ‘fast-play’, in which battalions were represented, but divisions were the minimum level of commitment by commanders and around which action and victory/defeat would be determined. These elements are definitely in the rules, but the combination of an overly onerous command phase, too many tests and too many unnecessary factors in tables lead to a stop-start system in which the numerous good points are lost in irrelevant detail. The turn sequence of Et Sans Résultat seems logical, simple and sensible. In the command phase, players send orders, commit leaders to lead formations and rally troops. This is followed by movement of troops according to their orders, skirmish combat, artillery fire, combat resolution and the morale of divisions (termed ‘combat assessment’). Finally there is checking the fate of leaders. However, it became immediately evident that the reality did to match the positive impression. A long list of command actions as the first phase of each turn meant that a significant amount of time had elapsed before we touched a figure. This was over one hour for us as novices to the rules in our first game, particularly since the rules’ anomalies generated much discussion, checking and re-checking, while making notes for this review. We’d expect this time to be reduced to around 10-20 minutes per turn once one is au fait with the rules. Nevertheless this is a significant amount of time to spend on sorting out various command aspects rather than moving the figures, which I think is what most wargamers enjoy doing more! The explanation of the command phase does not clearly specify how it should be done. There is a list of leader actions that may be undertaken, “until one fails”. Makes sense. What is not clear is, does the order of the list indicate the order in which these command actions must be attempted? Given that it commences with 'issue orders', I assumed that it was hierarchical, but the statement in the rules that “Players should consider the order in which they attempt Leader Action Tests as a failed Leader Action prevents further attempts until the following turn” seems to indicate that they are not. It is not entirely clear. A greater problem is the mechanism of issuing orders. In a throw back to Empire, players dice to see if an order is transmitted, with failure being either outright or a delay in delivery. That’s not too bad, but the nuances are a little strange. If the commander is committed to the division orders are not automatically transmitted, but rather his ‘influence’ modifier is added to the die roll. This seems a little strange—the leader is beside the divisional commander, but the latter is still potentially ignoring him. What is more bizarre is that the roll for the other divisions in his command are reduced by the commander’s influence rating. So, committing a better commander to a division in his command has a greater negative effect on the command of the other divisions than if a poor commander does?! This phase was made more difficult to work through since the tables of modifiers and results for the Leader Actions are not printed in the rulebook. They are on the quick reference sheet, but it would make sense to have them in the rules as well, particular since players refer to the rulebook often when first using a set of rules. This is a simple enough oversight that I’m sure will be easily rectified, but it added to our overall frustration with this phase of the rules. Our final beef with the command section is the use of a set of objective and movement cards to define the order. Never fans of having cards and counters on the table, we ignored this entirely and opted for the command arrow drawn on a map that we use in Shako. This simply and pictorially represents the path, extent and limit of an attack (or manoeuvre or support in the case of these rules) and obviates the need for more ‘stuff’ on the table. 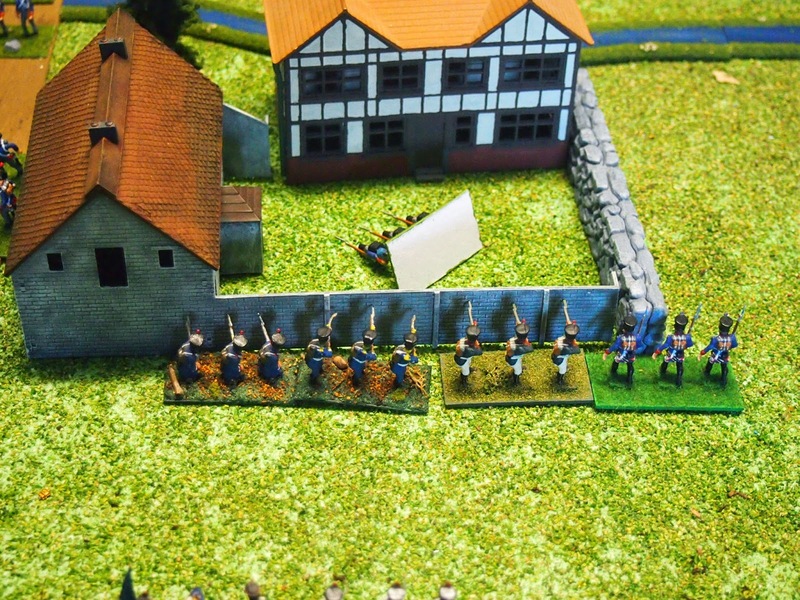 Having managed to transmit an order to two of the French commands, Piré's cavalry and Bachelu’s infantry who were both on a support order, the remainder having either failed outright or been delayed**, we moved those troops and then proceeded to the next phase. (**We discussed whether to enact our scenario rule, whereby the formations have initial orders, but decided that it was a better test of the rules not to do so). In our case, skirmish combat was irrelevant, as no formations had come close enough, so we moved to artillery fire. This lead to a most bizarre situation. In a set of rules where infantry divisions move a max. of 15" cross-country and cavalry 18", maximum artillery fire is 12". A maximum effective artillery range of 900 yards does not seems too bad, but the relativities with movement seemed all out of wack. Two views of the table at the end of the first turn. Piré’s light cavalry (centre of the first photo) and Bachelu’s infantry (foreground of the second photo) were the only troops to have moved on the French side. Both being on support orders, they did not progress far. 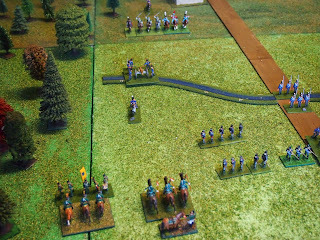 The die with a ‘1’ beside the French infantry at the left of the top photo is to indicate that they, Jérôme’s division, had a delay of one turn in receiving their orders. That ended turn 1, since there was no combat either and nothing for commanders to be at risk from. 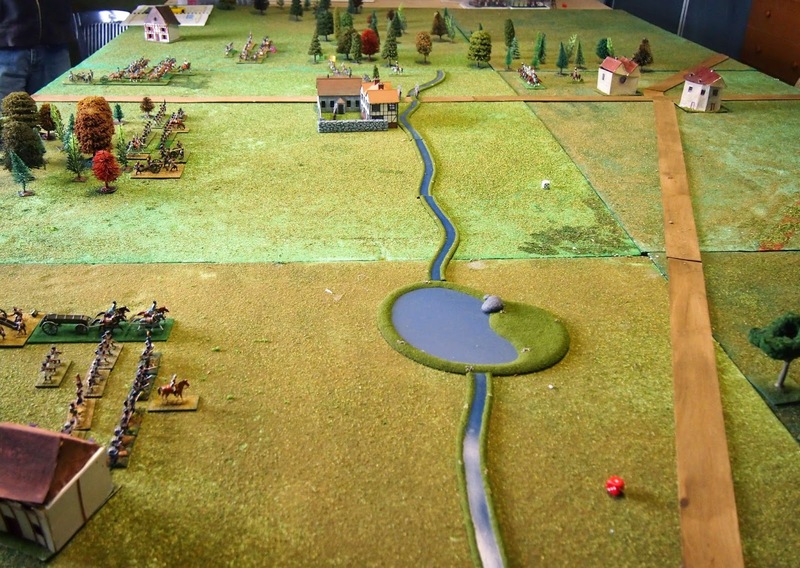 A turn does only represent around 20 minutes, but in that time we had failed a heap of orders, moved a few cavalry and infantry a short distance, fired no guns and precious little else. This, in a battle where historically, by our start time, the troops present had begun to come to grips—perhaps we should have had initial orders? We had a few more formations moving in turn 2. Jérôme’s division received its delayed order, so was able to move into contact with Perponcher’s troops in the Bossu Wood and Piré’s cavalry charged the Nassau and Dutch troops to the east of the wood. The problem of the relativity of movement and artillery range meant that the Dutch guns did not have a chance to fire before being charged by the fast-moving cavalry. Their chance would come in the artillery phase. Contact! 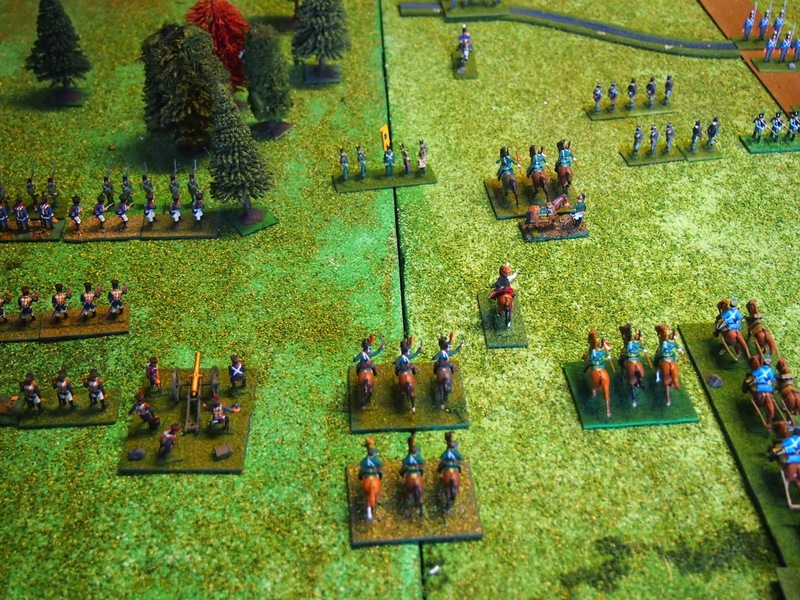 While Jérôme’s lead units attack Saxe-Weimar’s Nassauers (Perponcher’s division), Piré’s lead cavalry regiments charge in against their countrymen and the Dutch battery outside the wood. This second movement phase raised further questions for which we could not find answers in the rules. The first was regarding reserves. As the allied side had reserves arriving, whose orders did not arrive, we wondered how far they were able to come onto the table? The rules once again being silent, we resorted to what we normally do. The second regarded the movement of artillery. To prevent artillery ‘free-wheeling’ around the table, it is necessary to test to commit artillery or to have previously committed artillery move. This is another Leader Action, taking a full turn, in the former case, if successful. What happens to artillery in a division that did not receive its orders? Do these really apply to horse artillery, as the rules seem to indicate? We now had our first skirmish phase. This is a stylised system that Mr Ensteness explains as being about gaining “skirmish superiority under the notion that it will allow for various tactical advantages as the formed units come to contact”. The opposing commanders determine their level of commitment of troops to skirmish combat and then roll a number of D6, based on this commitment, to determine who wins the combat. A further roll, modified according to the level of commitment and whether the side won or lost the skirmish combat determines losses to each side. I was not enamoured with this system when I read the rules and this did not change upon playing them. It seemed to be a lot of effort, at this level for a result that impacted on the division as a whole. Why not simply have a skirmish factor and wrap it up in the overall combat? Next, we had our first artillery fire. The Dutch guns fired using two D6, requiring 5s and 6s to hit at point blank range. They missed. So, having spent a turn looking at the French, they were charged from over 900 yards and did no damage to the attacking units! Perhaps we had done this incorrectly, but we could not see that we had. Having failed to inflict any casualties on the cavalry as they charged in, the Dutch artillery were forced to retire in the ensuing mêlée. When I read the rules I thought that the combat resolution system looked to be well thought out. Here, at least, I was not disappointed. It is intuitive, simple and produced sensible results. That said, even here there was a key concept that we were unable to resolve and another example of too many factors in these rules. The Nassau infantry repulsed the charge of the French chasseurs à cheval. At this scale, forming squares is included in the combat resolution. Foy’s lead units attacked the Belgian militia in Gemioncourt. The latter’s losses took them beyond their ‘break point’, so they were removed form the table. 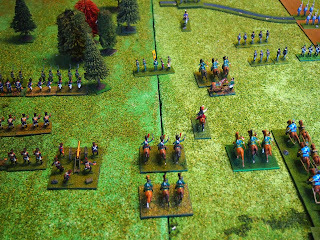 In a neat mechanic, the presence of supporting units (within 3” of the unit in combat) is used as a combat result. Units suffering some form of ‘push back’ retire behind the supports. The only problems are, what is the definition of ‘behind’ (regarding moving behind) and what happens if a unit does not have supports? Our search for answers in the rules proving fruitless, we determined that units without supports should move back to what is termed the ‘engagement zone’. Such a key concept should be easy to find. In another throw back to Empire, units in combat may suffer both hits and fatigue. This requires tracking of two factors for each unit and division. Is this really necessary for a game that is operating predominantly at the brigade/division level? Surely, the use of a single factor would make accounting easier without losing any feel or compromising the mechanics? We ended the game at this point. View of the table at the end of turn 2 and end of our play-test. The seeming order of this photo belies the frustrating experience that it had been. The two turns had taken us over four hours to complete. Admittedly this was in part driven by our long discussions regarding the mechanics, how they related to other rules and in making notes for this review, but it was also due to needing to paw over the rules trying to find clarification to our many questions. We did not get a clear sense of the scale at which the rules were trying to operate. We expected a brigade/division level set of rules with relatively simple but elegant mechanics that integrated lower-level aspects (such as units and formations). As mentioned above, there are some excellent mechanics in these rules, but, from our play-test, they appeared somewhat confused as to the level at which they are trying to operate. This, combined with gaps in the writing regarding fundamental aspects of the rules lead to a less than satisfactory experience. We were using a pre-publication, penultimate version of the rules, so perhaps some of the things that we found have been rectified. We have sent a list of our suggestions and the problems that we encountered to Mr Ensteness for possible incorporation, along with those of other play-testers, into the published first edition. 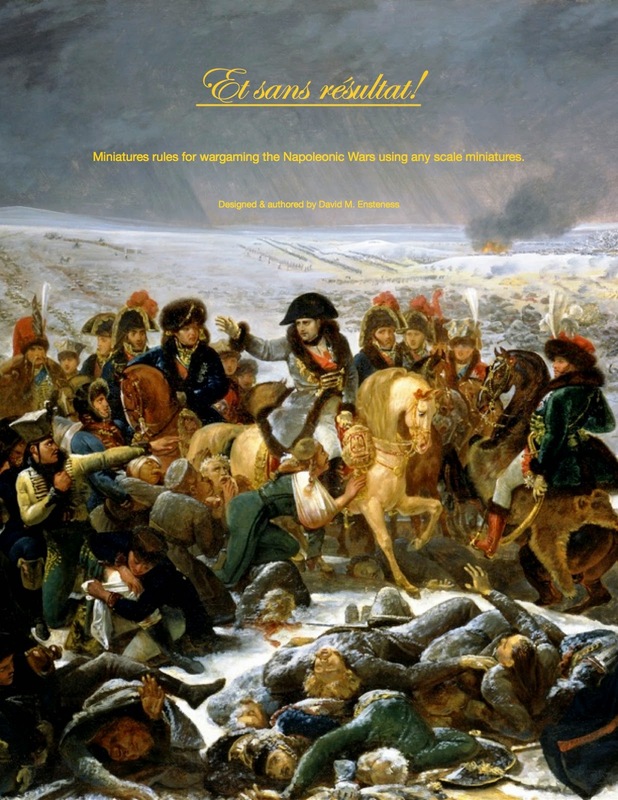 I am hopeful that our comments will be useful in revising the rules and am confident that, with some more clarification of what is intended and revision of some of the specific mechanics, the promise of a novel and genuinely innovative set of rules will emerge so as to warrant "yet another set of rules for Napoleonics”. Interesting review James. The test for all rules is what happens to new players if the authors not there to translate or speed you up through the reaction tests. 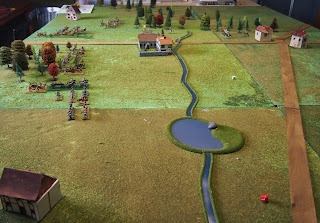 I am mystified as to why anyone would want to add to the already vast list of Napoleonic wargames rules, especially as the hobby has had so many problems from rules. It seems to me that if one has an entire day, or a weekend for a larger battle, Shako works beautifully, whilst for a club evening, Nap's Battles enjoys widespread and deserved support. What is however useful is to dialogue amongst ourselves as wargamers about specific rules and issues that arise in practice with our chosen set. Thanks for the review. Hopefully the author will make good use nof the feedback. Having written some rules myself, I am well aware that what you "assume" everyone will understand is far from what they actually will, so having players with no prior knowledge of the rules take them out for a test drive and trash them as much as they can is actually quite invaluable. It seems that we are the first 'independent' play-testers (certainly the first 'published' that I am aware of). It will be interesting to see whether other's experience is in any way like ours. We hope that the effort in playing and reviewing in detail is put to some use. Interesting point raised by Julian above. I am not a huge collector of rules, but I still have of the order of six sets of rules for Napoleonics that have not made it past the reading stage, a similar number that did not survive past one or two play-tests. There are the two sets that I have used in the past which are now in dis-use. That leaves our preferred set, Shako (which we have still found the need to adapt) plus General de Brigade that I am happy to use. Add to this Napoleon's Battles that I'll use as friends at the NWS do. A think about rules used by bloggers various would have "homespun" rules as the winner in terms of number of users (or course, this is a non-homogenous set). Others that seem to be used regularly are General de Brigade, Blackpowder, Shako, Napoleon's Battles. Also mentioned a fair bit are Lasalle, Le Feu Sacre, Field of Battle and Grande Armée. Blucher may be added to that list if people who are looking at them adopt them--why you want to use rules with blinds is beyond me, but that's my bias! So, of the 50s?, 100s? of rules for Napoleonic wargaming, only a handful are used regularly. Is this qualitative 'analysis' anywhere near accurate? (I suspect that the story is similar of rules in languages other than English). James, thank you for the review and the time spent to actually attempt a play-through. Often times we see reviews whereby the reviewer simply reads the rules and imagines how they "might" play without having pushed any lead around the table. For your test, that certainly was not the case. I congratulate you! Your group made a valiant attempt and I am sure the author appreciates that effort even if the final account is not favorable. I, too, have a pre-pub version of the rules but the set never saw any action on my gaming table. I would have liked to give them a go and still may. For me, it is difficult to judge a set of rules or game on only one playing. So many outcomes can be quite singular in nature and may not represent the "average" result. With that in mind, could your preconceptions regarding your favored rules, Shako, have influenced your initial impressions? Sometimes different is not bad but...different! Since a game/ruleset is usuallymirrors the author's view (bias) of combat and what he deems important, when I first pick up rules or game for consideration I ask myself if I buy into the author's viewpoint. If not, then no matter how hard I try, my bias can taint the outcome. Great job on an interesting review and play-through. Thanks for your encouraging comments as ever Jonathan. I can only hope that the effort we went to is used/appreciated. You are dead right, of course, we do bring our biases to such activities. However, in this case, I think it was less in evidence than normal as we were not trying the rules as a serious contender for adoption by us. Therefore we could openly and honestly merely play them 'as writ'. Naturally, the more we got bogged down in questions of detail that did not seem to be answered, the more we compared where we'd have got to with another set. As you have a published copy, I'd be interested to know if there are any changes compared with the 'final release review' version that we used. Could you look at some of the aspects that I mentioned above to see if you can find them in the rules? 1. Tables of modifiers and results for calculating leader actions not present in the rule booklet (although printed on the quick reference sheets)? 2. Clarification of the order of attempting leader actions. Is it in the order presented in the table on p 15, or at the player's discretion? 3. Can you see where it is specified exactly how a losing unit falls back behind support? Is it immediately behind or x inches? What happens if there is no support? Page 28 specifies support, but not how the fall back works. 4. If you are keen, have a go at working through the skirmish combat. Perhaps put a few figures out as opposing divisions and do a calculation. Does it seem a lot of mucking around to you to then merely reduce the effectiveness of the division as per combat resolution? I'm most keen to see what the experiences of others are with these rules. Rules a quite a personal thing, so no doubt they will be ideal for certain players and groups. All the more reason to have these problems ironed out. I see nothing in these rules to tempt me and like you cannot quite get my head around the lack troop density - our Quatre Bras was wall to wall bodies - this looks more like DBA on a large board! We're perfectly happy to nose around other sets but have yet to find anything to challenge GdeB although as our games get bigger & bigger the games get longer & longer, maybe there is a happy medium big battalion set out there? Not including Black Powder please. It's great what people are doing with Blackpowder--big games, lots of players, emphasis on fun, but they are not for us either. Too fast-play, beer and skittles kind of thing. We find that Shako is a good compromise. Still sufficient detail, but you don't get bogged down in large games. Have you tried them? You could even still use your large units at a pinch as the actual size of units is somewhat abitrary. We find that they scale up and down easily, within reason. You already use the scenarios...haha!! Watched this game played with the author at Little Wars and bought a copy after. It is definitely not an explicit set of rules – seems that the author knows that, he posted on the Yahoo group a couple days ago about it, he seemed to say it was intentional that if he felt the exact use of a rule didn't matter then he didn't want to "complicate" the rules with lots of examples. He actually used your example of a unit retiring behind support! That doesn't bother me but I can totally see how it would lead some players to frustration. You guys used a pre-published copy – did the author offer you the release copy? Some of the stuff you struggled with seems "fixed" in the one I bought – for instance it says right on the combat chart what happens to units that lose combat without support. 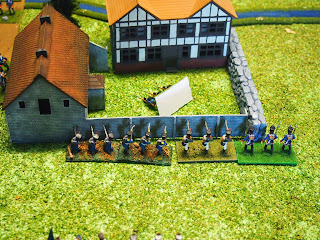 Order activations looked to go pretty easy in the Little Wars game it seemed almost impossible for the French to fail their activations, the Russians didn't even seem to struggle until they were in the fight! Looking at the modifiers table for activating orders it seems like worst case is you need an average die roll to pass. In your play test how did your French fail to activate? Jim, thanks so much for this reply. To activate, by the table in the quick reference chart, the player rolls two D6 and adds modifiers. In our case, the only modifiers appropriate for the French commanders were to add the influence rating of Ney (the issuing commander), +2, and of the receiving subordinate commanders (Jerome 0, Foy +1 Piré +1, Bachelu +1). On a modified roll 5 or less the order fails, 6 to 9 it is delayed half D6 turns, 10 or more success. Piré and Bacheu (both with support orders) succeeded, Jerome failed for half D6 (1) turn and Foy failed for half D6 (1) turn. On the allied side all failed for, from memory, 2 or 3 turns. which affected van Merlen's cavalry and (later) the on-coming reserves of Brunswick and Picton. Ah, you are absolutely correct, the result without supports is at the bottom of the combat resolution table, but not the one in the rule book. It that case we did not go back to the quick reference sheet, but instead went hunting through the rules for the answer. So, I apologise to the rules. The result is to "rout to their Reformation Area" (6–12" behind the division), which I disagree with, but it is there. We used the "For Final Release Review" version of the rules. Mr Ensteness said that this was little changed, so would be fine for our play-test. We are happy to interpret rules and, of course do. That said, we are probably spoilt with Shako as in a set of rules that, in the case of the published Shako II, is 96 pages long, printed in a font around the size of Arial 12, with lots of spacing (130 pages when you count the tables that we rarely, if ever consult), we are able to find the answer to all fundamental rules. After many games, where we have disagreed consistently with the rules (particularly changes between version I and II) or found them wanting (for Cossacks) we have reverted to the original rules or written our own rules (squares, divisional morale). Et Sans Resultat is 40 pages of main rules, printed in a font around the size of Arial 10. That extends to 74 pages with Appendices and two pages of Index. There is a fair amount of detail, so I'd expect the fundamentals to be there, especially for first-time players of the rules to work through. On the charts there is a table in the command section that shows the numerical value of each letter, a D = +2, a C = +3, an A = +5. I'm guessing that would have made a HUGE difference since Ney + Jerome = +8 to the die roll and that's the worst of the bunch! When the dutch guns fired on the cavalry did they do a 'paced bombardment' or fire intensely? if they fire intense they'd get all their dice instead of just two and I'm thinking with a division of cavalry coming down on them they'd be clearing their tubes as fast as they could manage! I'm excited to play these but don't know when that will happen, watching the game at little wars was fun, there were quite a few hangers on. You are indeed correct, we (or more to the point me, since I was the one largely 'working' the tables) used the incorrect leadership rating. That means that divisions would have been activated from turn one, which is much better. It does bring up two points though. Firstly, it makes the penalty to other divisions of having a leader attached even greater and compounded further against commanders with better ratings. Secondly, the near impossibility of French, particularly, to fail leader actions (as you mentioned in your initial comments above). Oh yeah, the Dutch guns used 'intense' firing--they were fighting for their existence! On that note I was pleased that the fatigue effect of such firing was not as dramatic as a reading of the rules might have suggested. I look forward to your play-test. Do you run a blog, or will you post it anywhere? If you wanted to, I'd be happy to post it on this blog as a comparison with our own.